Look what I spotted on the streets of Glasgow the other day.. 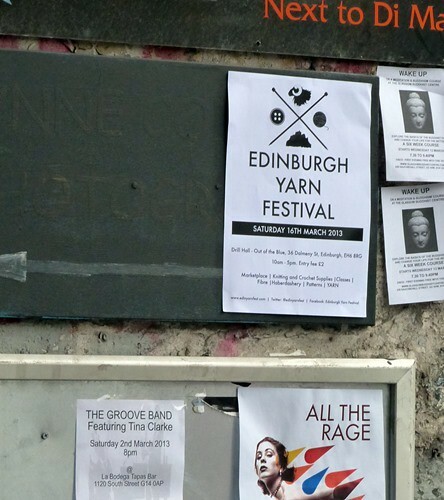 The inaugural Edinburgh Yarn Festival is taking place on March 16 at Edinburgh's Out of the Blue arts venue and I am terribly, terribly excited. The day looks to be pretty spectacular: more than 35 stall holders (some of whom are completely new to me! ), interesting classes, and a lot of fab, fab people there. The real emphasis is upon Scottish talent in the textile world and the organisers have come up with some crackers. I know we have a really special thing going on with dyers & designers here in Scotland but it still feels amazing to see the roll call at EYF: Ysolda, Ripples Crafts, Old Maiden Aunt, Skein Queen, Yarn Pony, Tin Can Knits, Kristen Orme, Travelling Yarns, Shilasdair, Alpaca Loft Fibre and OwnPrintPanda. Several fabulous local yarn shops are also supporting the event: Once A Sheep, Woolfish, Wee Country Yarns, and The Woolly Brew all have stalls and the marvellous Kathy's Knits is extending her opening hours (remember, stockist of the ultra-rare St. Kilda laceweight!). A real smorgasbord of the best we have to offer here in Scotland. Plus the Festival is also playing hosts to some serious English talent. None other than Susan Crawford will be there with some exciting news about A Stitch in Time Vol. 1! Textile Garden will be showing off their outstanding selection of buttons. LionessArts and her beautiful yarns will be there too, good god. And I’ll be there too. I am teaching a class on two-hand colour knitting - it’s completely sold out, sorry - and as a special treat, the class participants will be the very first people to get a pattern from my Doggerland collection. You’ll see several of my designs on the Old Maiden Aunt stand including the OMA yarn club patterns. Please do say hello if you see me. I'll probably be my usual stressed, awkward self but I love meeting people who share my passions. My partner David will be there too, so if you see a skinny man wearing a beetroot-coloured jumper, that's the one. He doesn't knit but he adores knitters. I am so, so excited. It’s Saturday March 16. £2 on the door at Out of the Blue (the Old Drill Hall), Edinburgh. Come support the Scottish creative community! Gosh, it is going to be so much fun.